A near future where camshafts don't exist and performance is revolutionised! This article was first published in 2001. Cams, lifters, pushrods... all these things have up until now been associated with the internal combustion engine. But the end is near or these lovely shiny metal objects that comprise the valve train hardware in your pride and joy (Owners of the technically far more advanced rotary are excluded!) Camless engine technology is soon to be a reality for mass-produced vehicles. In the camless valvetrain, the valve motion is controlled directly by a valve actuator - there's no camshaft or connecting mechanisms. Various studies have shown that a camless valve train can eliminate many otherwise necessary engine design trade-offs. Noise has been identified as the main problem with the electromechanical actuator technology, arising from high contact velocities of the actuator's moving parts. For this noise to be reduced, a so-called soft-landing of the valves has to be achieved. 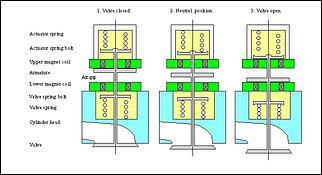 In a conventional valvetrain, the soft-landing is mechanically embedded into the shape of the camshaft lobe. One Electromechanical Valve Train (EMVT), developed by Siemens Automotive Systems has already been demonstrated at full load in a 16-valve four-cylinder engine. Jacobs Vehicle Equipment Co is another company involved in this field of research, but in diesel truck engines. Their direction is towards the Electrohydraulic Valve Actuation Technology (EHVT). International Truck and Engine Corp is another engine manufacturer poised to take a huge step forward in diesel engine design, announcing that it will eliminate camshafts from its diesel engines and replace them with electronic-valve timing systems by the year 2007. The long 6-year delay by International is due to testing. Where mechanical systems can be put on a dyno and tested for a couple of thousand hours, electronic testing must be done in such places as Alaska and Death Valley, where equipment can be subjected to temperature extremes. Engineers say they need two summers and two winters of testing to be satisfied they've got all the bugs out. The valvetrain in a typical internal combustion engine comprises several moving components. Some are rotating and some are moving in a linear manner. Included Included are poppet valves that are operated by rocker arms or tappets, with valve springs used to return the valves to their seats. In such a system the parasitic power losses are major - power is wasted in accelerating and decelerating the components of the valvetrain. Friction of the camshaft, springs, cam belts, etc also robs us of precious power and worsens fuel economy, not to mention contributing to wear and tear. The power draw on the crankshaft to operate the conventional valve train is 5 to 10 percent of total power output. Another factor working against the conventional valve train is that of the cam profile. Usually , it is fixed to deliver only one specific cam timing. The cam lobes have to be shaped such that when the valve travels up and down at the engines maximum speed it should still be able to slow down and gently contact the valve seat. You don't want valves crashing down on their valve seats. It results in an engine that is real noisy and has a short life expectancy. 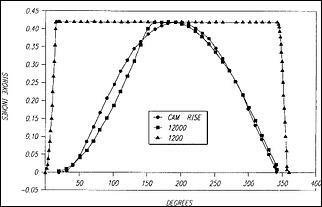 You are all aware that having different cam profiles will result in different engine characteristics. While high-rpm power and low rpm-torque can be each optimised, a compromise is required to obtain the best of both in the same engine. With Variable Valve Timing (VVT) technologies the compromise is getting better and better - reasonable low down torque and high-speed power are being produced by many sub 2-litre engines. But the problem remains that the cam grind is still a fixed quantity - or two fixed quantities in the case of Honda V-TEC engines. That's why the Electromechanical Valve Train is considered the next evolution of VVT. With the potential to dial in any conceivable valve timing at any point of the combustion cycle for each individual cylinder, valves can be opened with more lift and/or duration , as the computer deems necessary. Just imagine that you have your latest 2-litre 16-valve EMVT powered engine on the dyno after installing an exhaust. Simply changing a couple of numbers [Maybe lots of numbers! - Ed] on the computer will have a set of completely revised valve timing maps to suit your exhaust - or cold air intake for that mater. There will be no need for expensive cam changes that may not even give the results you are after. Electronically altering valve events will have a far more major impact on engine performance than any current electronically-controlled item. The types of camless variable valve actuating systems being developed can be classed in two groups: electrohydraulic and electromechanical. When it comes to electromechanical valve trains, there are several designs that are being trialed. Most developers are using the conventional poppet valve system (ie valves that look the same as in today's engines) but an alternative is a ball valve set up. Both use electromagnets in one way or another to open and close the valve. 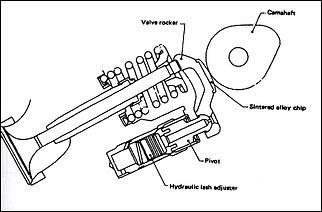 Originally created for the Apollo space program, the electrohydraulic valve actuator works by sending pressurised hydraulic fluid to the engine valve to move it open or closed. These systems are mainly retain poppet valves and are preferred by truck engine manufacturers. 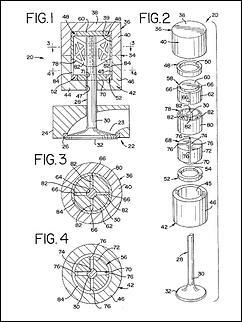 This type of system uses an armature attached to the valve stem.The outside casing contains a magnetic coil of some sort that can be used to either attract or repel the armature, hence opening or closing the valve. Most early systems employed solenoid and magnetic attraction/repulsion actuating principals using an iron or ferromagnetic armature. These types of armatures limited the performance of the actuator because they resulted in a variable air gap. As the air gap becomes larger (ie when the distance between the moving and stationary magnets or electromagnets increases), there is a reduction in the force. To maintain high forces on the armature as the size of the air gap increases, a higher current is employed in the coils of such devices. This increased current leads to higher energy losses in the system, not to mention non-linear behaviour that makes it difficult to obtain adequate performance. The result of this is that most such designs have high seating velocities (ie the valves slam open and shut hard!) and the system cannot vary the amount of valve lift. The electromechanical valve actuators of the latest poppet valve design eliminate the iron or ferromagnetic armature. 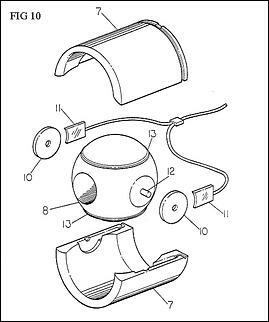 Instead it is replaced with a current-carrying armature coil. A magnetic field is generated by a magnetic field generator and is directed across the fixed air gap. An armature having a current-carrying armature coil is exposed to the magnetic field in the air gap. When a current is passed through the armature coil and that current is perpendicular to the magnetic field, a force is exerted on the armature.When a current runs through the armature coil in either direction and perpendicular to the magnetic field, an electromagnetic vector force, known as a Lorentz force, is exerted on the armature coil. The force generated on the armature coil drives the armature coil linearly in the air gap in a direction parallel with the valve stem. Depending on the direction of the current supplied to the armature coil, the valve will be driven toward an open or closed position. These latest electromechanical valve actuators develop higher and better-controlled forces than those designs mentioned previously. These forces are constant along the distance of travel of the armature because the size of the air gap does not change. The key component of the Siemens-developed infinitely variable electromechanical valve train is an armature-position sensor. This sensor ensures the exact position of the armature is known to the ECU at all times and allows the magnetic coil current to be adjusted to obtain the desired valve motion. Referring now to Figures 1 to 4, an electromechanical valve actuator of the poppet valve variety is illustrated in conjunction with an intake or exhaust valve (22). The valve (22) includes a valve closure member 28 having a cylindrical valve stem (30) and a cylindrical valve head (32) attached to the end of the stem (30). The valve actuator (20) of the poppet valve system generally includes a housing assembly (34) consisting of upper and lower tubular housing members (36) and (42), a magnetic field generator consisting of upper and lower field coils (48) and (52), a core (56) consisting of upper and lower core member (58) and (68), and an armature (78) suitably connected to the valve stem (30). The armature coil is preferably made from aluminium wire or other electrically conductive lightweight material, which is highly conductive for its mass. Minimising the armature mass is especially important in view of the rapid acceleration forces placed on it in both directions. The ability of the electromechanical valve actuator to generate force in either direction and to vary the amount of force applied to the armature in either direction is an important advantage of this design. For instance, varying the value of the current through the armature coil and/or changing the intensity of the magnetic field can control the speed of opening and closing of the valve. This method can also be used to slow the valve closure member to reduce the seating velocity, thereby lessening wear as well as reducing the resulting noise. 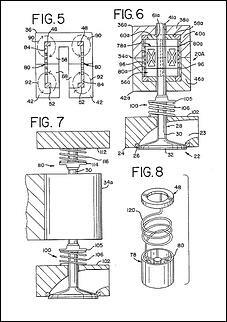 This system is able to operate without valve springs as shown in Figure 1 or can equally be equipped with them as shown in Figures 6 & 7. Siemens report that a special software algorithm is used to control the actuator coil currents such that the valves are decelerated to a speed near zero as they land - in conjunction with a switching time of barely three milliseconds. For the valves this means minimal wear and minimum noise generation. The 16-valve four cylinder engine that is currently undergoing tests in Germany, by Siemens, is equipped with 16 valve actuators and the corresponding armature-position sensors. A Siemens ECU is used and two cable rails connect the actuators to it. A 42-volt starter-generator provides the power. An alternative to the conventional poppet valve for use in camless valve trains is a ball valve. This type of electromechanical valve system consists of a ball through which a passage passes. If the ball is rotated such that the passage lines up with other openings in the valve assembly, gas can pass through it. (Exactly like the ball valves many of us use to control our boost.) Opening and closing the valve is accomplished by electromagnets positioned around its exterior. Referring to Figure 10, the valve housing (7) is shown in two pieces. Ball valve (8) has two rigidly attached pivots (12). The disc (10) is permanently attached and indexed to the ball valve and contains permanent magnets around its perimeter. The electromagnets (11) are situated on both sides of the ball valve (8) and they are fixed to the valve housing. The electromagnets are controlled through the ECU. A crank trigger sensor on the crankshaft provides information about the position of the pistons relative to top dead centre. Thus, at top dead centre of the power stroke, the ECM could be used to fix the polarity of both electromagnets so that they are of opposite polarity to the magnets in the ball valve, rotating the ball valve to the closed position. The substitution of a simple, efficient ball valve and valve housing arrangement in a a four stroke reciprocation piston engine eliminates all the independent moving parts in the valve train. This may even be an improvement over the poppet valve camless system - the ball valve needs only to rotate on its axis to achieve the desired flow conditions, rather than be accelerated up and down in a linear fashion. A partially open ball valve state may also be able to be used to create more turbulence. Electromechanical valve train implementation would not be possible with a normal 12V electrical system. As has been covered previously in AutoSpeed ("Goodbye 12 volts... hello 42 volts! "), the automotive industry has chosen a 42V electrical system as the next automotive standard. Consequently, the energy demand of EMVT can be optimally matched by a crankshaft-mounted starter-generator (KSG - in Siemens speak) operating at 42V; it is integrated in the flywheel and designed for the starting process as well as generator operation. In general terms, present designs of electrohydraulic valves comprise poppet valves moveable between a first and second position. Used is a source of pressurised hydraulic fluid and a hydraulic actuator coupled to the poppet valve. The motion between a first and second position is responsive to the flow of the pressurised hydraulic fluid. An electrically operated hydraulic valve controls the flow of the pressurised hydraulic fluid to the hydraulic actuator. In one design, the provision is made for a three-way electrically operated valve to control the flow of the pressurised hydraulic fluid to the actuator. This supplies pressure when electrically pulsed open, and dumps actuator oil to the engine oil sump when the valve is electrically pulsed to close. The use of engine oil as the hydraulic fluid simplifies and lowers the cost of the design by removing the need for a separate hydraulic system. The basic design of the electrohydraulic valvetrain hardware is illustrated in Figure 11. The engine poppet valves (22) and the valve springs (24) that are used to reset them are shown. The poppet valves are driven by hydraulic actuators (26), which are controlled by electrically operated electro-hydraulic valves (28) supplying hydraulic fluid to the actuators via conduit (29). The preferred hydraulic fluid is engine oil, supplied to the electro-hydraulic valves by the pressure rail (30). An engine-driven hydraulic pump (32) supplies the oil pressure, receiving the oil from the engine oil sump (34). The pump output pressure is also limited by an unloader valve (36), as controlled by an accumulator (38) connected to the oil pressure rail. With this design the hydraulic pump could be periodically disconnected, such as under braking, so that the valve train would run off the stored accumulator hydraulic pressure. 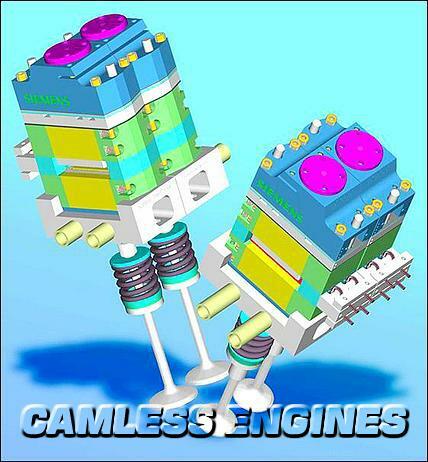 As is the trend with all modern engine systems, the camless engine has an even greater reliance on sensors. The valve actuation and control system typically needs a manifold pressure sensor, a manifold temperature sensor, a mass flow sensor, a coolant temperature sensor, a throttle position sensor, an exhaust gas sensor, a high resolution engine position encoder, a valve/ignition timing decoder controller, injection driver electronics, valve coil driver electronics, ignition coil driver electronics, air idle speed control driver electronics and power down control electronics. A valve developed by Sturman Industries is said to be about six times faster than conventional hydraulic valves. To achieve such speeds, it uses a tiny spool sandwiched between two electrical coils. By passing current back and forth between the coils, a microprocessor-based controller can quickly move the spool back and forth, thereby actuating the engine valves in accordance. 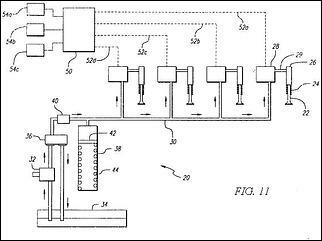 However, electrohydraulic systems are mostly being developed for diesel truck use because it is currently not clear whether the technology will have the speed needed for higher revving passenger car engines. The benefits of camless valve actuator systems are numerous. Let's begin with the most obvious one - infinitely variable valve timing. More torque is made available through out the rev-range due to the valve timing changes enabling optimal volumetric efficiency. This increases engine performance and decreases fuel consumption, also decreasing harmful emissions, increasing durability and engine life, and allowing compensation for different types of fuel and varying altitudes. Siemens claims that even today, fuel savings of at least ten per cent can be obtained in the European test cycle by using a camless valvetrain. Cylinder deactivation (ie an eight cylinder can become a six as needed!) is also possible, with the associated reduction in emissions. Further fuel consumption reductions could be obtained by combining camless valve technology with a high-pressure direct fuel injection system. (Siemens has also developed this type of system and its expected to be part of the camless valve train engine when it does reach production readiness.) The amount of engine oil required would also be dramatically reduced because no lubrication would be required for the traditional complex camshaft valve system. Cold start wear would also be minimal to the valve train hardware. There is also a general consensus that electromechanical valve actuation will increase overall valvetrain efficiency by eliminating the frictional losses of the camshaft mechanism, the weight of the mechanism and the cam mechanism's drain of power from the crankshaft. The improvement in the speed of operation valve actuation and control system can be readily appreciated with reference to Figure 12. It shows a comparison between valve speeds of a mechanical camshaft engine and the camless engine valve actuation. The length of the valve stroke in inches versus degrees of rotation of a mechanical camshaft is illustrated. When graphed, the cycle of opening and closing of a valve driven by a mechanical camshaft will display a shape similar to a sine curve. The opening period (as measured in crankshaft degrees) remains constant for any engine load or rpm. However, the cycle of opening and closing of valves driven by the electromechanical valve actuators operates much faster. Designed to match valve-opening rates at the maximum engine rpm, the electromechanical valve actuators open the valve at this same rate regardless of engine operating conditions. Because of this improved speed, greater flexibility in programming valve events is possible, allowing for improved low-end torque, lower emissions and improved fuel economy. The massive opening period for the electromechanically driven valve can also be seen! Controlling the intake valve event can also eliminate the need for throttled operation in petrol engines, thereby reducing pumping losses and improving fuel economy - the throttle butterfly becomes redundant! In the un-throttled camless engine, the intake valves' opening duration is used for cylinder airflow regulation, rather than a throttle or air-bypass valve. A simplification of the induction system results and a more compact engine design is thus possible. This leads to valve specific intake trumpets with less restriction to give the best breathing capabilities. Although, it needs to be said that there are reported problems with respect to idle control of a throttleless design, with stable unthrottled engine operation difficult to achieve during low load, and more precisely, during idle conditions. An internal EGR (exhaust gas recirculation) function can be created by increasing valve overlap as appropriate. Similarly, the intake valve may be opened and closed several times during the intake or exhaust sequence to promote scavenging and later to follow the piston to promote intake volumetric optimisation, and intake and exhaust valves may be dithered to control engine throttling and braking. Using camless valve actuators permits reprogramming to allow the engine to operate in reverse . This can be done by simply inverting one input wire pair. 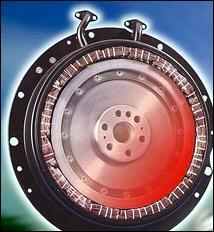 Reverse operation is advantageous in marine equipment having dual outdrives or T-drives. This feature would also eliminate the need for reverse gear in the transmission since forward gears would be used to operate in either vehicle direction. This provides an opportunity for multiple reverse gears without the added hardware. However, the future is not necessarily as rosy as the above states. There are many problems to be overcome with the electronically controlled valves. The problems lie not only in the software required but also the mechanisms of the actuators. Coil transient response times and saturation effects at high rpm are just some of the issues. Stand assured though, that the answer to these problems is only a matter of 'when' and not 'if' . International Truck and Engine Corp. The first steam turbine powered vessel - and it was the fastest in the world! What are the risks and benefits?